And the main post for today has to go to Irish boxer Katie Taylor. What a win - her fifth time taking the European title at 60kgs. She beat Russian Sofya Ochigava 10 - 5 in the final last night. 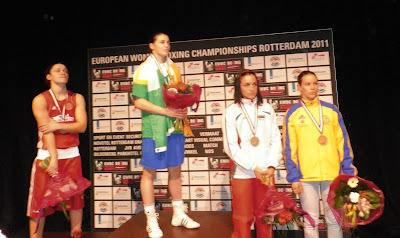 I watched the fight here on the European Women Boxing Championships site. It was a slow enough start with both fighters seeming to hand out the respect in shovels but once Taylor started landing with her right, Ochigava knew all about it. A full report is over on this post. If you click through some of the other fights, interesting to see some of the women wearing the infamous skirts. These have been creeping into MuayThai too, not a big fan but some say it's progress so ... The commentary is in Dutch and you need to download Silverlight (link on the site). Some great fights, well worth the effort. But strangely seems to be just Dutch fighters up there now. The other results are listed here on the EWBC website. Talk about inspiring! Katie Taylor is nothing short of amazing! BTW, I love the new design! Amazing story. Good job Katie Taylor. This is definitely a level up for a girl power. With your achievements, you are inspiring others to engage also in some sports. Keep on winning.